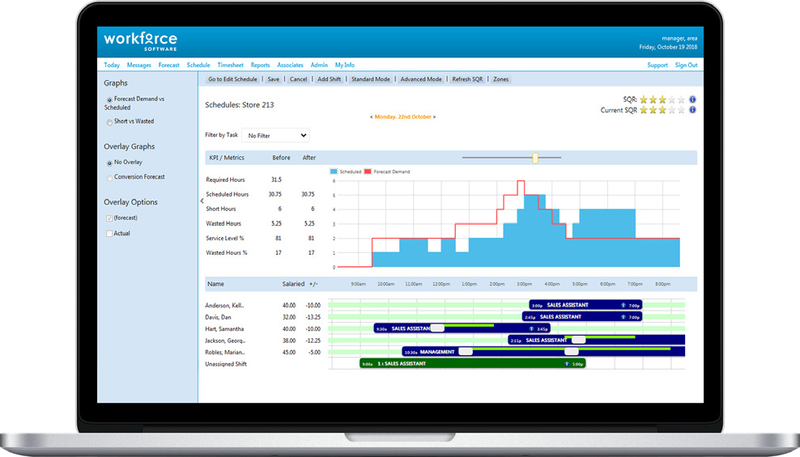 Get real-time views of all schedules across the business so you can identify and resolve issues instantly. Make better decisions to increase schedule quality and improve employee productivity. Our smart workforce scheduling solution provides everything from simple, template-based schedules to auto-generated schedules based on employee availability and KPI optimization. Our workforce scheduling solution delivers measurable improvements to your bottom line. To ensure managers create schedules that meet organizational objectives, we have created the Schedule Quality Rating (SQR) which is unique to WorkForce Software. Every time a schedule is created, its quality is rated based on a variety of KPIs, including how closely it fits the forecast demand. An example SQR may combine service level, effectiveness and schedule to budget variance, all weighted to reflect your own unique business goals. Our products are designed with a focus on usability. The intuitive user interface makes the product easy to use and familiar and responsive schedule views mean minimal training is required to get staff up and running. WorkForce Forecasting and Scheduling enables you to create legally compliant schedules based on local labor law and working hour regulations. You can define your own organizational ‘hard’ and ‘soft’ constraints, ensuring every store creates compliant schedules first time, every time. You are able to automatically warn local managers if they try to publish a non-compliant schedule, providing additional protection from being sued for non-compliance. Companies today want more than legally compliant schedules, they want engaged, happy, loyal employees. Our workforce scheduling solutions aim to give staff a better work-life balance and more predictable and consistent schedules. The mobile app means employees can input into how their schedule looks, edit their availability and set their work preferences. Employees have commitments outside of work, such as childcare, study, family commitments or other work / life balance needs and our mobile scheduling app helps managers consider all of this when building each schedule. Happy staff = happy customers. As well as using employee preferences and availability from our mobile app, WorkForce Software has a broad set of standard interfaces linking your schedules to data within other business systems. This ensures that every schedule considers factors such as HR leave entitlements, payroll hours or availability. There are many integration options to ensure a smooth data flow between our scheduling solution and other business systems such as HR, Payroll, Traffic, POS and Time and Attendance. Get in touch to find out more.